As China opens up to visitors, many of its most-cherished but least-known treasures are becoming known for the first time. BTN this week takes a look at Suzhou (or Soochow), a city about 60 miles west of Shanghai, known for its canals, bridges and classical gardens situated on the Yangtze River and the shores of Lake Tai. It is ideal for a break if you are in Shanghai for business, or an additional destination if on a tour. The Classical Gardens of Suzhou were added to the list of the UNESCO World Heritage Sites in 1997. Suzhou is often dubbed the 'Venice of the East' or 'Venice of China'. Suzhou is the original place of 'Jasmine', a song sung by Chinese singers or actresses thousands of times on the occasion of almost every important meeting or celebration. Jasmine is the symbol of Suzhou as well as Tai Hu Lake. 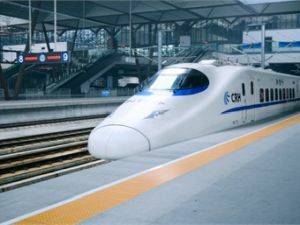 Daily there are 170 pairs of high-speed trains running between Shanghai and Suzhou from early morning till late at night, with the shortest interval of 1min and the quickest travel time of just 22min. Currently Shanghai is served non-stop from Heathrow by British Airways twice daily, and with single flights by China Eastern and Virgin Atlantic. Suzhou is a day visit but if you need to stay, the international hotel brands have moved in, including Shangri-La, InterContinental, Marriott and Wyndham. You can stay ‘locally’ for as little as £15 per night but even the chain properties are asking not more than £125 at the present time. Don’t think of Suzhou as just part of ancient China. It is a city of 10m with 1,500 foreign companies. The Suzhou Industrial Park is the largest cooperative project between the Chinese and Singaporean governments. 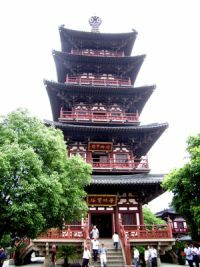 At the summit of Tiger Hill stands the oldest pagoda in Suzhou, Yunyan, or Cloud Rock Pagoda. Also called Huqiu Tower, this 1,000-year-old, eight-sided stone temple rises seven storeys and has become the unofficial symbol of Suzhou. Thousands flock to see the temple’s notorious tilt — almost as drastic as Italy’s Leaning Tower of Pisa. From active monasteries to ancient remains, Suzhou is home to a colourful collection of China’s most cherished temples. Located along bustling Guanqian Street, Xuanmiao Temple, or Temple of Mystery, is believed to be Suzhou’s only surviving example of Song dynasty architecture and now functions as the city’s premier Taoist temple. Crowned by dramatic eaves, Three Purities Hall (the temple’s main attraction) boasts a collection of colossal pillars delicately inlaid with Taoist deities. It is considered the epicentre for Taoist music in Suzhou, and we visitors were lured in by the temple monks’ entrancing melodies. Dubbed one of the 10 great temples in China, Hanshan Temple, or Cold Mountain Temple, has a history of more than 1,500 years and is famed for its bell-ringing ceremony on New Year’s Eve, as well as its inclusion in the poem Mooring for the Night at Fengqiao Bridge. One can see the poem inscribed on a stone tablet near Maple Bridge. Also among the temple’s top attractions are its Grand Prayer Hall, Sutra Library and one of the city’s best outlooks, Puming Pagoda. At nearly 2.5 acres, Xiyuan Temple is the largest Buddhist monastery in Suzhou. Also called West Garden Temple, the 700-year-old masterpiece exhibits a flawless balance of architecture, sculpture and gardens. The temple’s yellow walls and curled eaves lead visitors to Arhat Hall’s collection of 500 life-sized statues of gilded Buddhist saints. Within its flourishing garden is the peaceful Life-Releasing Pond. It is believed that for the past 300 years, the pool’s primary residents – turtles – have been released from captivity and now live among the temple’s ancient trees and fragrant flora. Dating back 1,700 years and measuring nearly 250ft (76m) tall, Suzhou’s North Temple Pagoda, also known as Beisi Pagoda or Gratitude-Paying Temple, is the oldest and tallest pagoda south of the Yangtze River. Sometimes shrouded in mist, the nine-storey pagoda dominates the skyline with its octagonal frame and mesmerising brick-and-wooden façade. On a clear day, visitors can climb the spiral staircase to the top for sweeping views of Suzhou and beyond. China is a country with a very modern outlook but with some fine traditions. Suzhou fits into this very well.